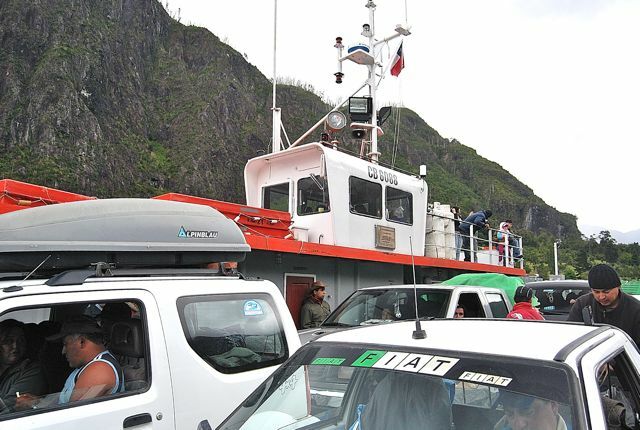 It took longer than anybody expected, but Naviera Austral's ferry Pincoya finally reached the ramp at Chaitén (pictured below) around 3:30 p.m. on Wednesday - roughly seven hours late. As it happened, we sailed on time from Puerto Montt at 9 p.m. Tuesday, but the aging shallow-draft vessel (in service since 1971) could not handle the Golfo de Ancud’s high winds and surging tides. Instead, it anchored for the night and, when we awoke the next morning, we were still well short of our destination. One of my companions on the voyage was Nicholas La Penna of Chaitur, who runs the bus terminal and only left town briefly after the eruption of Volcán Chaitén in May of 2008. For those planning a trip on the Carretera Austral, with or without their own transportation, he’s the first source of information on accommodations, food and transportation into and out of town - including visits to Parque Pumalín, which reopened to the public December 20th. Chaitén itself is coming alive, if slowly, thanks to the government’s decision to restore utility services in most of the town despite its proximity to the volcano which, however, was emitting only occasional wisps of steam (as opposed to my visit in March of 2009, when it was sending out clouds of steam and smoke). 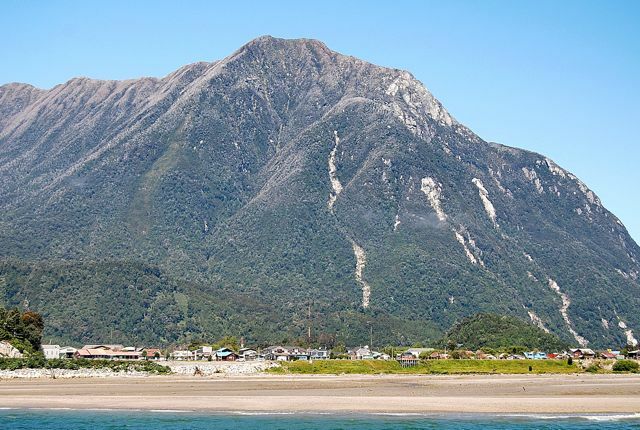 Several accommodations and restaurants have reopened, air-taxi flights are arriving from Puerto Montt, and bus service has resumed to and from the Aisén regional capital of Coyhaique, though it’s limited as yet. The Copec gas station has reopened, supermarkets have fresh food, and the place is looking far tidier than it did last year. 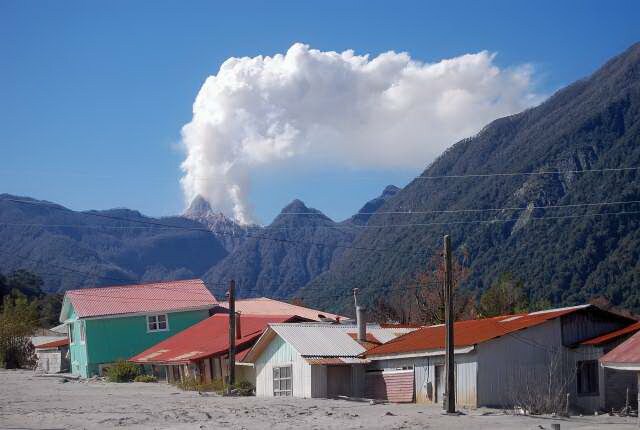 Still, it’s not likely to reach the population figures it had before any time soon - at present, Chaitén has perhaps ten percent of the 4,000-plus residents who lived here before the eruption. 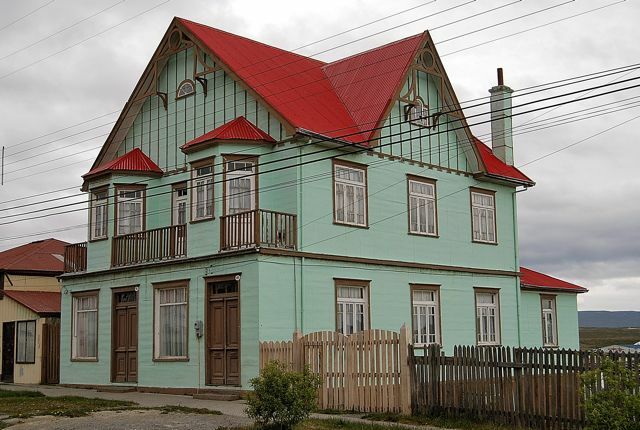 While the government has also decided to relocate provincial government offices from their temporary quarters at Futaleufú, it faces some difficult questions - primarily, what will be the line of demarcation for residents who want to reoccupy their houses? Clearly those along the Río Blanco, whose ash-clogged waters nearly destroyed them, are beyond salvation, but others will be tougher calls. Meanwhile, the road north to Parque Pumalín has reopened though, if there’s another eruption, it would soon be obliterated again. Still it’s an object lesson in the effects of vulcanism, as the southern beeches on and around the slopes of Volcán Chaitén have turned a ghostly grey with the effects of the eruption and the ash fall. At the same, some of the streams are starting to run clear again, and rhubarb-like nalcas are colonizing the ash falls. All the park’s campgrounds have reopened, as have Caleta Gonzalo’s seven stylish cabañas, which I stayed in for the first time - while they’re on the small side, they are truly stylish and cozy, and some have lofts that can accommodate up to half a dozen visitors. There is now 24-hour electricity from a turbine, and the acclaimed café (pictured below) is serving breakfast, lunch, and dinner. Things figure to get busier when the Naviera Austral ferry from Hornopirén starts service on Sunday. Having grown up in the Pacific Northwest, a region whose natural environment of sheltered inland waterways, islands and forested mountains so closely resembles southern Chile, I have always considered ferries an integral part of the public transportation system. On and around Puget Sound, the terrain often made it impossible to build enough roads and bridges, or unnecessary to do so when a simpler solution - a car-carrying vessel - was a cheaper, more efficient and more elegant response to the problem. In some ways, Chile has always understood this and, over the recent holiday, I got a glimpse of this on a visit to the Hotel Mítico Puelo (pictured above), a former fishing lodge that’s reinventing itself as an activities-oriented destination on Lago Tagua Tagua, about 150 km southeast of Puerto Varas (fishing will remain part of the Mítico’s mix, but the idea is to include trekking, riding and other options). The hotel is only accessible by Naviera Paredes’ ferry Caupolicán (pictured below), which shuttles twice daily from the west of the lake to Puerto Maldonado, at the east end, where a road is proceeding toward the Argentine border. On Sunday, when I returned to Puerto Varas, I did so via the south shore of the Estero de Reloncaví, where the roll-on, roll-off ferries Gobernador Figueroa and Trauco (pictured below) shuttle back and forth between ramps at Puelches and La Arena from 6:45 a.m. until half past midnight. Tonight I’ll be taking Naviera Austral’s ferry Pincoya to Chaitén as I begin to update my coverage of the Carretera Austral for the upcoming third edition of Moon Handbooks Patagonia. 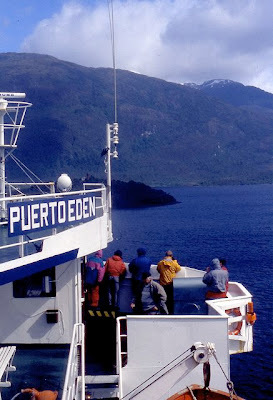 Given the history of Chilean ferries, it’s unfortunate that the Ministerio de Obras Públicas (MOP, Public Works Ministry) has placed priority on overland “connectivity” between the northerly town of Hornopirén and the Parque Pumalín gateway of Caleta Gonzalo, through almost impossibly difficult terrain at great environmental cost. Partly, this stems from the fact that one of MOP’s jobs is to build roads, and partly from an archaic theory of geopolitics that spurs it to reinforce the state’s presence in Pumalín - despite the fact that Chilean sovereignty is beyond question. Chile’s ferry system, though, desperately needs modernization. In reality, to reinforce that presence in the thinly populated region between Puerto Montt and Puerto Natales and improve connectivity to its heartland, the country would do better to create a modern maritime system like the Washington State Ferries, Canada’s BC Ferries or, better yet, the Alaska Marine Highway System. Despite the fact that the territory of another country separates Alaska from the rest of the United States, and that the area is almost as thinly populated as Chilean Patagonia, sovereignty has not been an issue there for nearly a century and a half. In a visit to Naviera's Austral's Puerto Montt offices today, I learned that - despite Naviera's map in my previous post - all the ferries from Hornopirén to Caleta Gonzalo will be non-stop until at least mid-January; after that, they may get permission to use the overland connection from Leptepu to Fiordo Largo. Likewise, in another visit, I learned from Cielomaraustral (cielomaraustral@surnet.cl) that they are flying air taxis from Puerto Montt to Chaitén almost every day (about US$85 one-way). 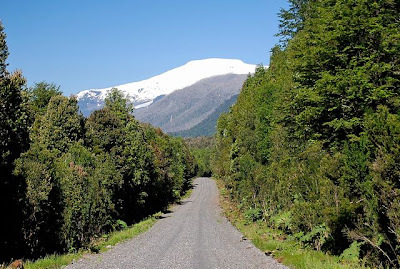 Chile’s top road trip, the Carretera Austral, has been the subject of several recent developments that will make this summer an interesting one on the discontinuous pioneer highway that starts in Puerto Montt and ends just south of the remote hamlet of Villa O’Higgins. 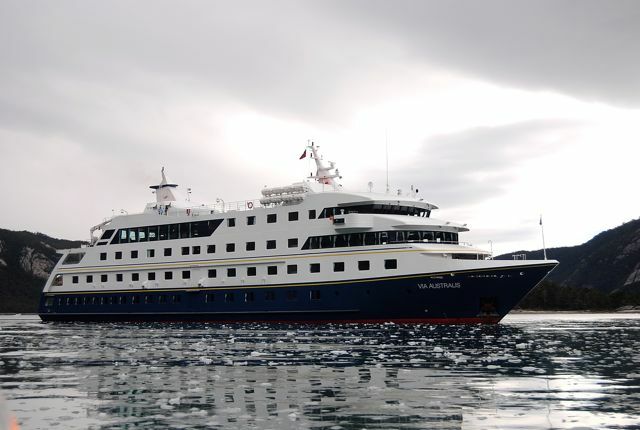 In the first instance, Naviera Austral (Spanish-only website) will start ferry service from Hornopirén to Caleta Gonzalo, the gateway to Parque Pumalín, on January 2nd. According to an email I received from their Puerto Montt office, there will be service at 9:00 a.m. on January 2, 3, 4, 9, 10, 11 and 16, returning the same days at 3:30 p.m. There is, as yet, no indication of service beyond January 16th, but this route is normally open in January and February only. This year’s itinerary, though, is a little different than in years past. Previously it went directly from Hornopirén to Caleta Gonzalo, but this year the Mailén will sail only to Leptepu, where vehicles will then have to drive about ten km to Fiordo Largo to board another vessel for the short hop to Caleta Gonzalo (the map above shows this horizontally, though most maps of Chile appear in a vertical format; north is to the left in this instance). This, of course, begs the question as to how pedestrian passengers will cover that distance. For what it’s worth, the vehicle fare is 66,500 Chilean pesos (about US$140 at today’s exchange rate), while each passenger pays 10,000 Chilean pesos (about US$21). The resumption of service to Caleta Gonzalo also signifies the reopening of Parque Pumalín, which has been closed for nearly two years since the eruption of Volcán Chaitén. 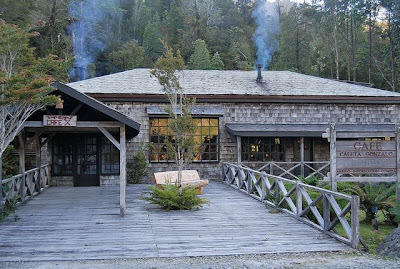 According to park spokesperson Carolina Morgado, whom I visited in Puerto Varas on Tuesday, the visitor center, restaurant and cabañas at Caleta Gonzalo, as well as campgrounds throughout the park, are once again open to the public. 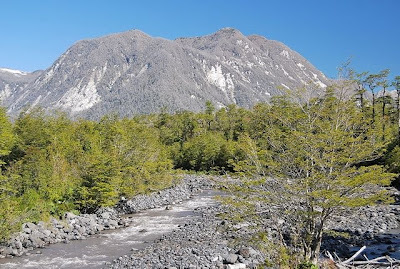 Meanwhile, according to the Santiago daily El Mercurio, the Chilean government has backed off its plans to evacuate Chaitén itself, and will try to salvage those areas unaffected by the eruption and subsequent flooding of the Río Blanco (flooding caused most of the damage, depositing large amounts of waterlogged ash in the areas nearest the river). It will restore water and electrical service, and Chaitén may continue to be a major point of connectivity between continental and archipelagic Chile - even if the much of the town comprises a Chilean Pompeii that could become a macabre tourist destination in its own right. 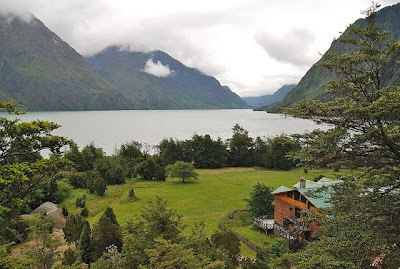 For my part, I will be ferrying to Chaitén from Puerto Montt the night of Tuesday the 28th, arriving the following morning and then turning north for a night at Caleta Gonzalo before continuing to Futaleufú for the New Year. The rest of the Carretera Austral awaits. Today's digest consists of observations on streets and roads in Argentina and Chile. Is it dangerous to travel in the Southern Cone countries? Well, in the process of updating the current edition of Moon Handbooks Patagonia, I’ve driven about 1,700 kilometers since leaving Santiago on December 8th. In the course of doing so, I occasionally encounter delays for road works that, almost invariably, warn drivers of the hazards ahead: “Peligro a 100 M” (Danger 100 Meters) is the common phrase. So pervasive are these signs, in fact, that there’s a joke about them. 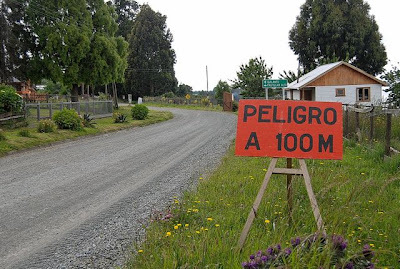 As a driver proceeds down the road, he spots a series of them: “Peligro a 500 M,” “Peligro a 200 M,” “Peligro a 100 M” and, finally, “¡Bienvenidos a Peligro!” (“Welcome to Danger!). From La Serena in the north to Puerto Montt in the south, Copec gas stations along Ruta 5, Chile’s segment of the Panamerican Highway, are not only places to stop for fuel but also to use the facilities and check email. With no password protection, Entel’s Internet services are free but, at the same time, Copec charges its clients 250 pesos (about US$0.50) to use the toilets. What this says about Chilean priorities, I’m not quite sure. Nearly thirty years ago, when I first lived in Buenos Aires, it was in the central Congreso district where my in-laws had a small apartment on a street named Cangallo, after a Peruvian locality that played a key role in the South American wars of independence. 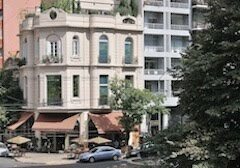 Until 2002, when we bought an apartment in Palermo, we continued to stay there whenever we were in Buenos Aires. In 1984, though, we found that we no longer lived on Cangallo, which had borne that name for more than a century. After the return to democracy in 1983, the street name miraculously became “Teniente General Juan Domingo Perón” (the caudillo’s diehard admirers almost always refer to him by his military rank rather than as president, despite the fact that he was elected to the office three times). During the military dictatorship of 1976-83, of course, Perón’s name was anathema but, under the civilian government of Raúl Alfonsín (a Radical rather than a Peronist), the city was free to honor the memory of the man who, for better or worse, transformed Argentina’s political culture (for what it’s worth, despite their misleading name, Argentina’s Radicals are a middle-of-the-road party). In reality, changes in street names are commonplace with almost every change of government in Argentina, and often at other times - if there’s a political point to be made. 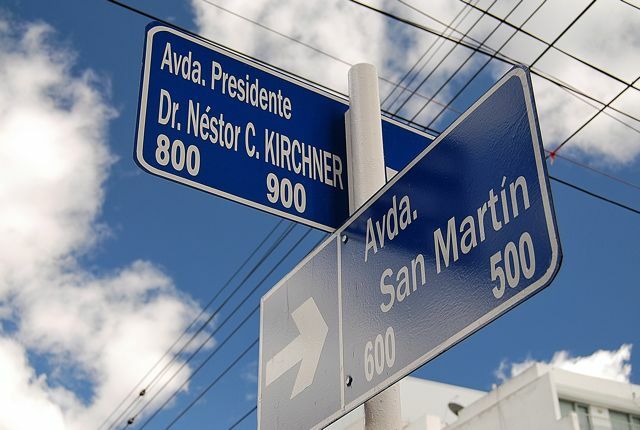 The most recent example is the renaming of the main avenue of the Patagonian city of Río Gallegos - on Saturday, the Avenida General Roca, originally named for the 19th-century military commander who defeated (some would say slaughtered) the Patagonian Mapuche, became “Avenida Dr. Néstor C. Kirchner,” after the former president who died of a massive heart attack in October. Kirchner, a former Gallegos resident and governor of Santa Cruz province before defeating two-term president Carlos Menem to win a long-shot race in 2003, is certainly the highest-profile public figure ever to emerge onto the national scene from Argentine Patagonia, so the honor is not undeserved. At the same time, as a guidebook writer, these changes present me a challenge - as I and my friend Nicolás Kugler update the current edition of Moon Handbooks Patagonia, we’ll have to change every address on the main drag in our coverage of the city, and on the map that accompanies it. Not so long ago, the least painful way of changing money for visitors to the Southern Cone countries was the ATM at the corner bank. It’s still the simplest but, as banks began to impose transaction fees about two years ago, it’s no longer painless--in Argentina, Chile and Uruguay, charges of US$3--7.50 per withdrawal have become commonplace. In fact, in Argentina and Uruguay, they’ve been universal for some time, but in Chile a handful of banks have held out against the trend. Recently, though, Corpbanca and Scotiabank have joined the stampede, leaving only two banks in the country that do not collect the fees: Banco Security, which has only five branches outside Santiago, and BancoEstado, the state-run bank that is often the only bank in small communities that otherwise would have no banking services whatsoever. Fortunately, that means BancoEstado has probably the widest network of ATMs in the country. BancoEstado is now my default option when I need to withdraw money from my accounts in the US, but some expats have complained that Chilean banks have recently reduced the maximum withdrawal per transaction from 390,000 pesos (about US$830) to 200,000 pesos (about US$425). My feeling is that this is more significant for those resident foreigners, who may make large household purchases or other payments, than it is to short-term visitors, who will pay many of their expenses by credit card. Still, the fewer transactions you have to make, the lower your transaction fees will be. 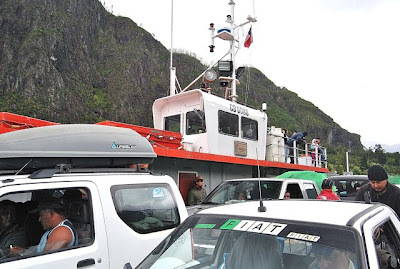 Meanwhile, according to my friend Hans Liechti of Travelaid in Pucón, Navimag has backed off its plan to withdraw service between Puerto Montt and Puerto Chacabuco, and will continue to operate the passenger and cargo ferry Puerto Edén (pictured above) until at least mid-February. At the same, Naviera Austral’s connections to the northern Carretera Austral port of Chaitén continue to be in flux or even disorder - in January, for instance, the ferry Don Baldo will sail weekly from the insular Chiloé port of Castro to Chaitén, but modifications underway on the ferry dock have meant that only passengers and bicycles - not automobiles or even motorcycles - have been able to use it. 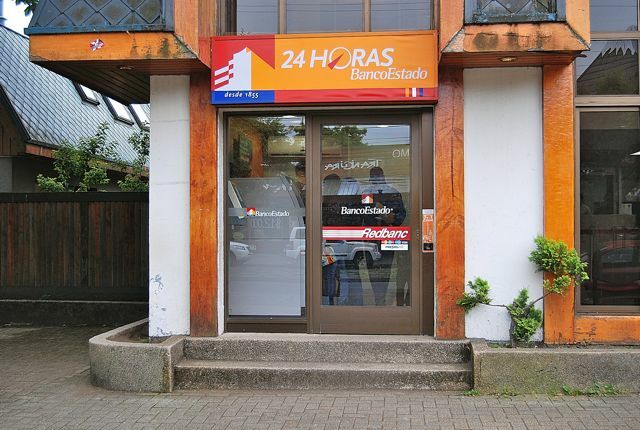 Fortunately, those works appear to have been completed and Naviera (whose abandoned Chaitén office appears below) is once again accepting vehicle reservations for the Don Baldo. On the other hand, Naviera’s other ferry Pincoya has been able to use the dock as it exists now, and will still sail from Puerto Montt to Chaitén at least twice weekly, carrying both automobiles and passengers - I’m scheduled to go on the evening of the 28th, arriving in Chaitén early the next morning. Space is limited, though, and I managed to snag one of the last vehicle spots on board. The best way to approach the Carretera Austral has been Naviera’s summer service from Hornopirén to Caleta Gonzalo, the gateway to Parque Pumalín. After the 2008 eruption of Volcán Chaitén damaged the road south of Caleta Gonzalo, though, that service has not operated for the last two seasons. After sending an email to Naviera about this season’s service, I received an ambiguous reply: “We are waiting for approval from the Ministry of Transportation to see if we will be able to operate this route and, whenever we have information, we will let you know.” Given that this service normally runs only in January and February, and the holidays are a major distraction, time is growing short. 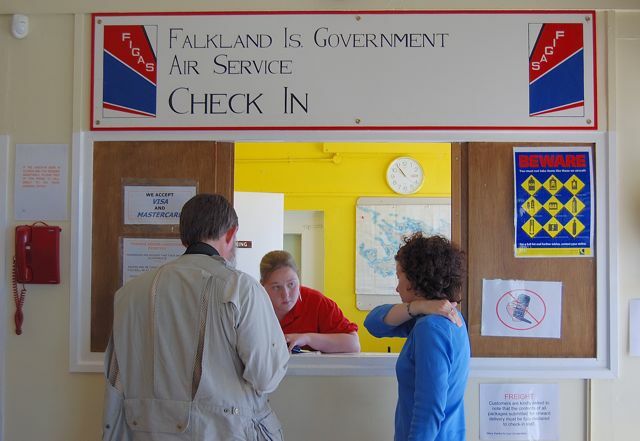 Today entry includes items from Chile, Argentina and the Falkland Islands. A White Xmas? In Summer? In the course of my research, I rarely spend the year’s end holidays at home with family - unless somehow we get together with my wife’s relatives in Olavarría, in Buenos Aires province. In southern South America, of course, it’s summer, and you’re likelier to need air-conditioning than a shovel to clear the snow off the sidewalk (leaving aside, for the moment, that we live in coastal California where snow is always rare). 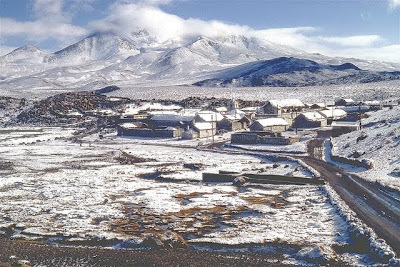 To be sure, if you seek out the heights of the Andes, you may have a white Xmas (when I lived at 4,400 meters above sea level in Parinacota (pictured above), Chile, summer was the rainy season and, at that altitude it could easily snow). Likewise, if you seek out high latitudes on the Southern Continental Icefield, you can virtually guarantee it. 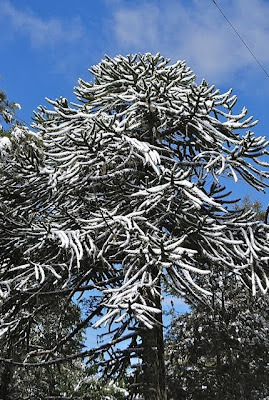 But I was nevertheless surprised last Saturday by a snowstorm in Parque Nacional Conguillío, in the relatively low-altitude, mid-latitude Andes east of Temuco. At 5 p.m., conditions threatened to become a whiteout, and I quickly headed down and south to the town of Melipeuco, where it was cold and damp but snow-free. 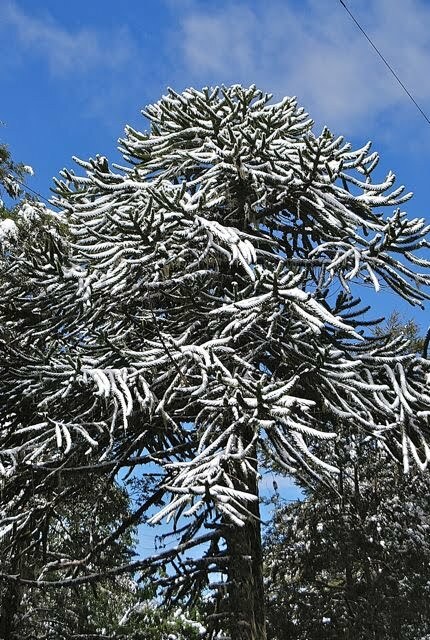 En route, though, I saw snow-covered monkey puzzle trees of the sort that drew pioneer conservationist John Muir here from California in the early 20th century. Even more strikingly, the volcanic slag heaps (pictured below) on the lower slopes of Volcán Llaima (whose steaming summit was obscured by cloud) turned from black to white in minutes. Except for rangers and park administrator Norberto Arias, with whom I briefly spoke in his office at Laguna Conguillío, I was the only person in the park. It warmed on Sunday, though, and the prospect of a white Xmas is receding by the minute - though, as I’m continuing farther south, it could still happen. My brief Conguillío excursion came at the end of long day’s drive that began near Curacautín, at the outstanding Bavarian-run guesthouse Andenrose, and proceeded to circle the park via Malalcahuello, Lonquimay, Liucura and Icalma. En route, I stopped to photograph this shrine to the Gaucho Antonio Gil, a Robin Hood figure and folk saint from Argentina’s Corrientes province whose cult has grown in the aftermath of that country’s economic meltdown of a decade ago. 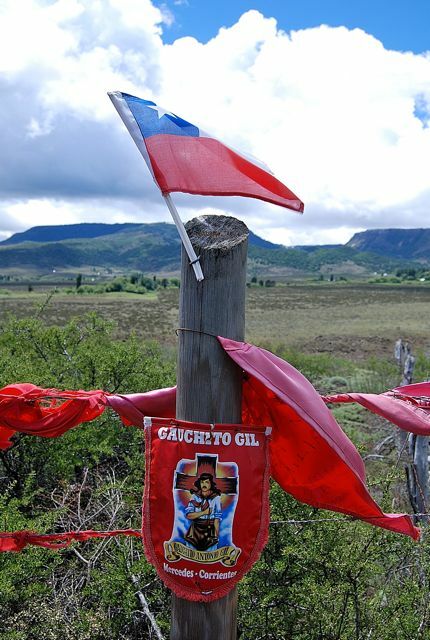 This was the first time, though, I have ever seen a Gaucho Gil shrine in Chile - a country that’s been almost untouched by regional and global financial crises. To be sure, the highway itself links Chile to the Argentine province of Neuquén but, even then, it’s jarring to see the Chilean flag flying above Gil’s shrine. Jim McAdam, the editor of the Falkland Islands Journal with whom I have corresponded for many years but never met (we just missed each other a couple weeks ago, as I was in the departure lounge at Mount Pleasant as he arrived from Punta Arenas), recently explored Argentine Tierra del Fuego in search of Falklands tussac grass, Poa flabellata. Once abundant throughout the Islands, the grass is exceptional wildlife habitat, especially for small birds - watch for the lurking sea lions, though - but much reduced by unrestricted grazing since the introduction of sheep in the 19th century. 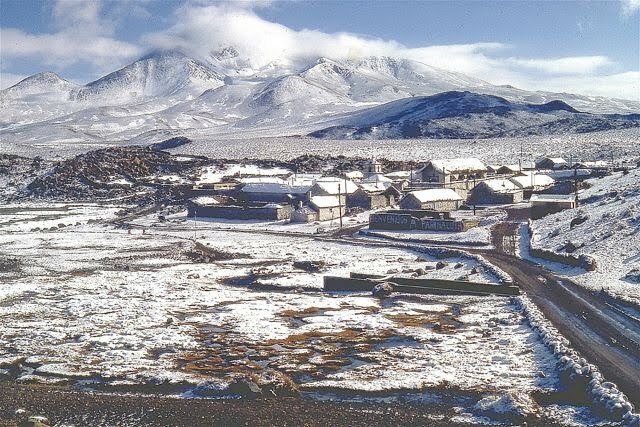 According to Jim, tussac ranges from South Georgia through the Falklands to eastern Tierra del Fuego (including Staten Island and the Wollastons), but “it is only thought to be present at one site on actual mainland Tierra del Fuego - the tip of the Mitre Peninsula near Cabo San Diego. We didn't make it, though, despite a three-day expedition on a quad bike.” He is interested in tussac’s DNA, to see if all came from the same original population. 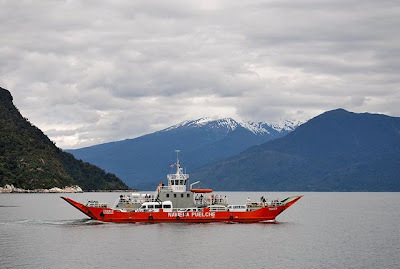 One of Chilean Patagonia’s most notable attractions is the scenic Patagonian fjords trip from Puerto Montt to Puerto Natales with the Navimag ferry company who, recently, have renamed their car/passenger vessel M/N Magallanes as the M/N Evangelistas, after an earlier vessel on the route. More importantly, according to product manager Adrien Champagnat, Navimag has remodeled the Magallanes to include some more spacious (and expensive) accommodations with greater amenities, though this will remain “the poor man’s cruise” - with cozy but comfortable budget bunks for backpackers. I’ve done the trip myself at least half a dozen times but, at the end of January, I will do it from south to north for the first time - I’ve always traveled from Puerto Montt to Natales before. Tentatively, I will be giving a couple digital slide presentations on Chilean and Argentine Patagonia on board. 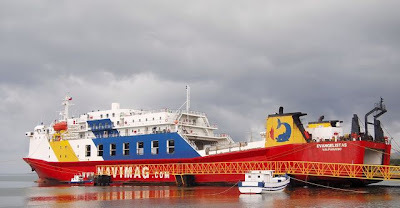 Meanwhile, in January, Navimag will retire the smaller M/N Puerto Edén, which used to ply this “inside passage” route and has been providing service from Puerto Montt to Puerto Chacabuco and Laguna San Rafael, in the Aisén region. This will leave Puerto Chacabuco (and the regional capital of Coyhaique, about an hour east) without ferry service for the first time in my memory, but Navimag’s sister company Navimag Cruceros will now sail to Laguna San Rafael from Puerto Montt, after least for this summer, on the Mare Australis, one of its small (100-passenger) cruise vessels (its twin sister, the Via Australis, appears in the photo below). This puts Cruceros in more direct competition with Cruceros Skorpios, which has been doing this route for decades - as a ferry company, Navimag could never match the amenities on Skorpios, but Cruceros can match or surpass them. At the same time, that leaves the Naviera Austral passenger/car ferries from the city of Castro (on the Isla Grande de Chiloé) to Chaitén as the major connection to the Carretera Austral and Coyhaique; I can only presume that commercial truck traffic to Coyhaique will now go through Argentina, as certain sections of the Carretera Austral are difficult or impossible for 18-wheelers. On Wednesday, for the first time since the February earthquake, I drove south from Santiago for about 500 km. It was a holiday, so traffic was light but even so, the road damages that I could see were minimal and detours few - in some places traffic was reduced to a single lane in each direction while repairs proceeded on the other side. In fact, someone not paying close attention might even assume that this was just routine maintenance or replacement but, in a few places, the roadway undulated, the guardrails were twisted, and there were temporary supports beneath overpasses as more urgent work took place elsewhere. I spent the night at El Rincón, a secluded German-run guesthouse roughly 120 km from the epicenter. Owned and run by Winfried and Elke Lohmar, it’s a rambling wooden structure, with extensive gardens, that bent but did not break despite the historic 8.8 magnitude of the event. They went without electricity for four days and the cell phone networks were saturated, but they had plenty of drinking water stored and were able to haul water from the nearby river to flush the toilets. The greatest problem was that their bookcases tumbled and their contents were scattered (the bookcases are now attached to the walls). 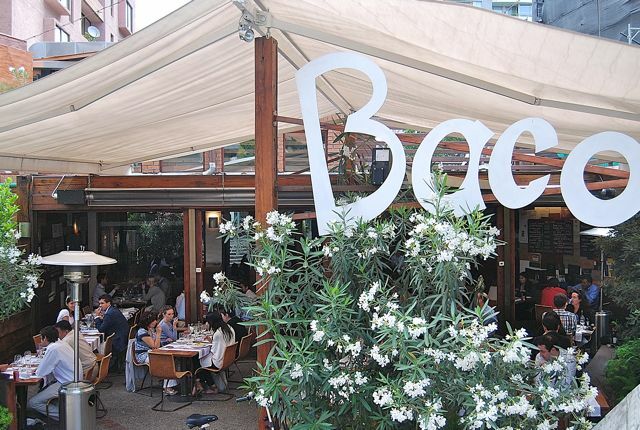 Meanwhile, according to the online magazine Planeta Joy, there’s a new trend in Buenos Aires restaurants - over the past several months, three Peronist restaurants have risen up, so to speak, in the Argentine capital, and another in the Buenos Aires province capital of La Plata. In a country whose politics are so personalized, and which often looks to past glories rather than future goals, nostalgia for Juan and Evita Perón is unsurprising, but it’s ironic that the gourmet ghetto of Palermo could become the locus of a gastronomic theme park inaccessible to their “shirtless” followers. 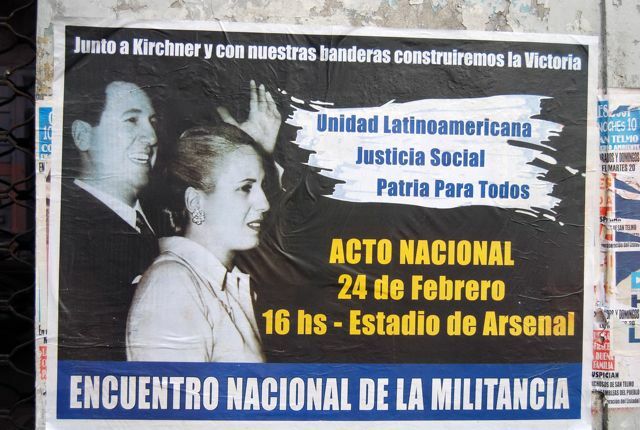 However unconsciously, though, Peronism thrives on irony. 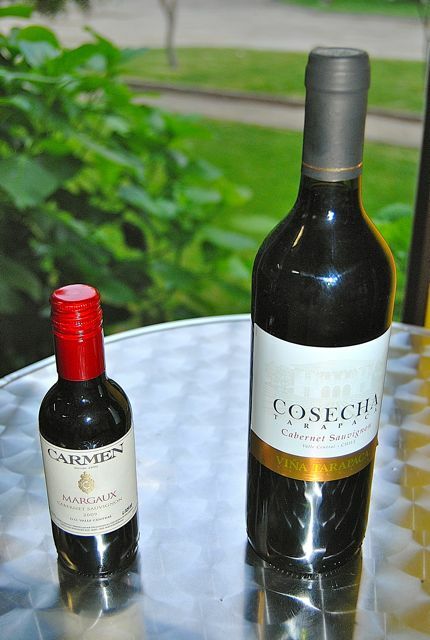 Chile is rightly known for its wines but, for visitors, those wines are not always so easy to find. To be sure, there are established wine routes in the Valle de Casablanca, Colchagua, Maule and other areas, but to find those same wines even in Santiago, much less elsewhere in the country, can be an effort. Many of the most innovative producers export upwards of 90 percent of their output, and the biggest wineries such as Concha y Toro and Errázuriz dominate the domestic market. That’s not to denigrate producers such as Concha y Toro and Errázuriz, which produces some truly fine wines, but it can be hard to find anything else except at a few small specialized wine shops and elite restaurants. It’s even harder to find wine by the glass - Chilean restaurateurs seem to fear that, if they open a bottle of wine for a customer to sample, nobody else would even consider even touching it and, in a week or so, they’ll have to pour it down the sink. Writing guidebooks as I do, I experience this a lot - part of my job is to eat in restaurants and, because I’m working in places where I don’t always know someone, I often dine alone. I enjoy a glass of wine with dinner, but in Chile that can be problematical because I can’t drink an entire bottle and often the only alternative is the botellín - a tiny bottle equivalent to a glass-plus (pictured above alongside a full-sized bottle). Usually it’s Santa Rita’s Carmen Margaux, a Cabernet that’s a passable table wine at home, but not what you want when dining out. There’s a somewhat bigger selection in half-bottles, but even those are less than the best, and smaller bodegas are still shut out. That may be changing slowly, however. The leader in this change may be Baco, a bistro-style restaurant and wine bar in the Santiago borough of Providencia, where I had dinner last week. Set back from a busy two-lane street, it offers a mostly Francophile menu that’s not a personal preference (though I liked the bread) - I chose gnocchi for my main dish - but the selection of wines by the glass more than compensated. In the tobacco-free main dining room, which includes a semi-circular bar and polished natural wood details, a chalkboard displays the day’s choices from both major and minor producers; on this warm evening, I first refreshed myself with a cool Anakena Viognier 2009 and then enjoyed a Gillmore Cabernet Franc 2006 with my entrée. Each glass of wine bears a circular label around the base so that you don’t forget what you’re drinking. Beyond the main dining room - which plays an oddly eclectic selection of music at a volume that does not disrupt conversation - there’s a secluded patio that’s also accessible from the parallel street to the east (where it has a small retail outlet selling the same wines it serves in the bistro). The patio, though attractive and sheltered, is the de facto property of smokers. 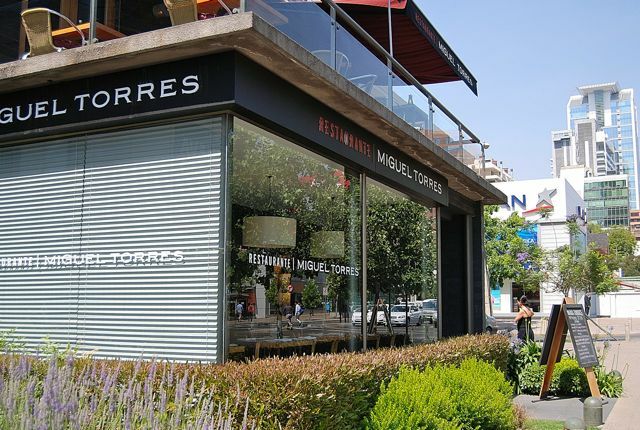 Meanwhile, one of the country biggest producers has expanded its operations to Santiago proper: Miguel Torres, the Spanish company that has long operated a restaurant at its Curicó winery, now also operates the Restaurant Miguel Torres on the Isidora de Goyenechea restaurant row in Las Condes, called the “Sanhattan” of Santiago for its high-rise office buildings and apartments (nearly all of which withstood the February 27 earthquake with barely a scratch). For 7400 pesos (about $15), their midday Spanish-Mediterranean special includes a choice of appetizers (in my case, a sort of cucumber gazpacho), main dishes (I chose plateada, a braised beef brisket), and desserts (a blueberry cheesecake). Miguel Torres also offers reasonably priced wine by the glass though, in this case, it’s limited to their own winery. On balance, I liked the food better here, but would have appreciated a selection of wines from other bodegas. In the photo above, you are looking at three countries at the confluence of the Río Paraná and the Río Iguazú: Argentina in the foreground, Brazil just across the water, and Paraguay (on the far shore, where the skyline of Ciudad del Este, formerly Puerto Presidente Stroessner, is visible in the distance). This is the area known as the Triple Frontera, notorious for contraband drugs, weapons and, according to some, Islamic terrorist sympathizers - though there has never been any terrorist incident there. This has always been a porous border - in fact, in 2002, a Lonely Planet guidebook even suggested that US citizens could “borrow” an Argentine friend’s identification to visit the Brazilian side of Iguazú Falls without paying to obtain a visa. That was a suggestion that could have landed the borrower in a Brazilian prison, and caused a small furor in both countries, but after the controversy died down, there continued to be plenty of illicit movement across the border. Ciudad del Este is a story in its own right, in a country that (almost by acclamation) is one of the most corrupt in the world. Some years ago, when a reporter from The Wall Street Journal interviewed a local “businessman” about the possible impact of the Mercosur common market on Ciudad del Este, the response was “The way I understand it, we may have to stop smuggling things and start producing things.” In this year’s Transparency International corruption index, Paraguay ranked 146th of 178 countries, tied with (among others) Haiti, Iran and Libya. While Argentina (106th in Transparency’s survey) and Brazil (69th) may have only a little more to brag about in this regard, freewheeling Paraguay is the poster child for uncontrolled smuggling and, according to some sources, money-laundering operations with ties to Islamic terrorist groups in Ciudad del Este. That, apparently, is the reason Oscar-winning director Kathryn Bigelow is following up her mega-success The Hurt Locker with a film about the Triple Frontier that will star Tom Hanks, with rumored participation from Christian Bale, Javier Bardem, Johnny Depp, Denzel Washington, Sean Penn, Leonardo DiCaprio and Will Smith. Shooting will commence in March (for what it’s worth, my favorite Bigelow film is the Western-vampire classic Near Dark; perhaps her new villains could be undead suicide bombers). All the governments in question are upset that the film may portray the region as crawling with terrorists but, apparently, not so upset as to place obstacles in the way of a project that will bring millions of dollars into their countries. And in reality, the area is far from unsafe - hundreds of thousands of travelers visit Iguazú Falls every year without incident. 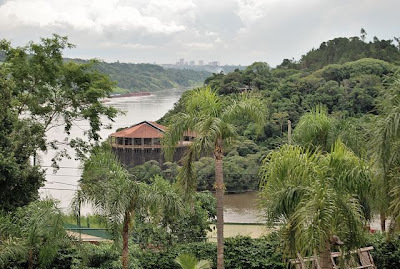 I myself have stayed in Puerto Iguazú at least a dozen times and have never witnessed or even heard of petty crime affecting tourists (though that doesn’t mean it never happens, and the area has a certain notoriety for auto theft). The larger Brazilian city of Foz do Iguaçu is, by most accounts, a riskier place, but most visitors cross the border to see the falls and not the city. For that matter, I’ve stayed in Ciudad del Este several times as well, with never a hint of an incident. One interesting development in the Transparency International survey is Chile’s status as No. 21. That’s not surprising in one regard, since Chile is invariably the most corruption-free country in all of Latin America, but this year it has overtaken the United States, which ranks 22nd (tied with Belgium) and is now barely ahead of Uruguay. 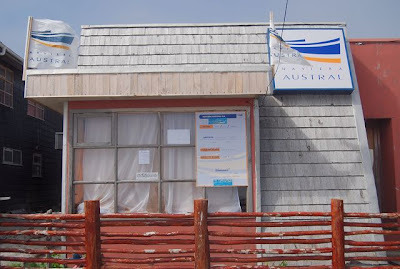 Today’s post is a potpourri of items from my last several days in the Falkland Islands, Punta Arenas and vicinity, and Santiago. It’s almost summer in the southern hemisphere, but from Monday’s weather in Punta Arenas, you’d hardly know it - as I was walking around the city, correcting the city map for the upcoming third edition of Moon Handbooks Patagonia, I encountered chill winds and several snow flurries, of all things. 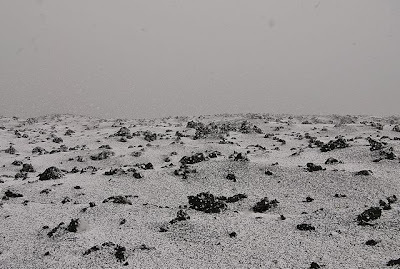 Admittedly, the flakes melted by the time they hit the ground, but it was still something out of the ordinary even in southern Patagonia’s notoriously changeable springtime weather. I could only imagine what hikers might be going through in Torres del Paine, which can get rougher weather than this city on the Strait of Magellan. In the evening, though, I managed to shake off the cool day at dinner with my friend Steve Beldham, a Brit whom I met in the Falklands more than 20 years ago, at Damiana Elena (pictured above) - widely considered the city’s top restaurant. In a classic century-old house, Damiana Elena is simultaneously spacious and intimate, consisting of several small dining rooms - ideal for a romantic dinner. My own entrée of cannelloni stuffed with scallops and palm hearts was spectacular; the only minor complaint was the dessert of white chocolate mousse, which could have been lighter. Among last night’s diners was city mayor Vladimiro Mimica (who, like many local residents, is of Croatian descent). FIGAS: the World's Friendliest Airline? The other day my post on the Falklands described getting around the Islands, but it didn’t really address my affection for what I consider my favorite airline. At one time, flying anywhere was fun but, given the security hysteria of the past decade, commercial aviation is more stressful than anything else. On FIGAS flights from Stanley to the outer islands, such as Carcass and Bleaker, there are no full body scans and, if you want to take a bottle of water on board, it’s not big deal. Not only that but, if you’re lucky, you get to sit alongside a pilot like Eddie Anderson who, over the headphones, describes every feature of the landscape he’s overflown hundreds if not thousands of times. 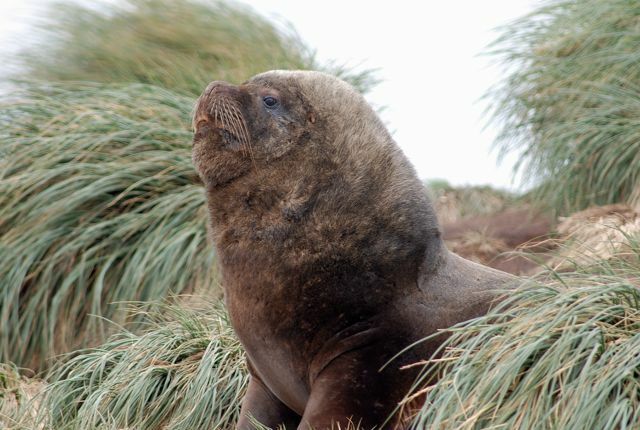 Eddie, a devoted conservationist, owns several small Falkland Sound islands that are home to the world’s largest concentration of southern giant petrels (rather homely birds that, however, are graceful in flight). At the same time, FIGAS is a social, and sociable, experience. With only a week in the Islands, it was impossible for me to revisit every place and person I know from my time there but, as the flights make multiple stops en route, it’s often possible to say hello to people you can’t pay a longer visit to. En route to Carcass Island, for instance, we dropped several tourists at Saunders Island, where I was at least able to greet David and Suzan Pole-Evans when they came to pick up their guests (though not without a mild admonition that “You’re not visiting us this time, then?”). 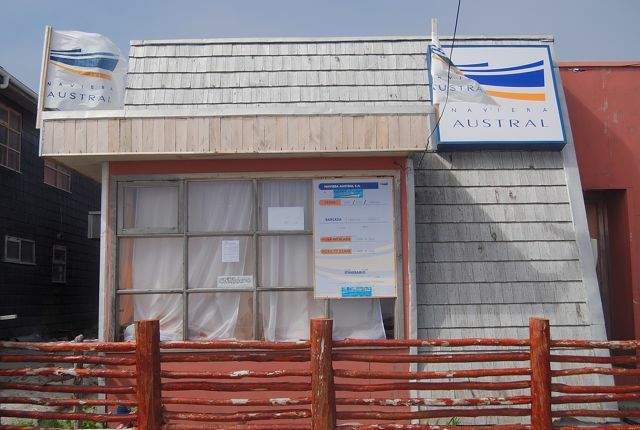 Punta Arenas is virtually dead on Sundays but it’s a great day to visit the Tierra del Fuego town of Porvenir, about 2-1/2 hours east by Transbordadora Austral Broom’s new ferry Crux Australis. Sunday’s trip, which leaves at 9:30 a.m. and returns at 5 p.m., allows visitors to spend most of the day in Porvenir, and many locals take advantage of it to visit their families. I don't have family there, obviously, but I took advantage of the schedule to lunch on conger eel in a scallop sauce at the Club Croata, the Croatian club that’s the best restaurant in town. Porvenir, for what it’s worth, means “the future,” but a town with barely 5,000 inhabitants has its limitations. For those curious about the Falklands, in many ways it resembles Stanley - an elongated town along a sheltered harbor, with many landmark houses of Georgian and Victorian style, a central plaza studded with topiary cypresses, and a good museum that’s due to move to new quarters next year. 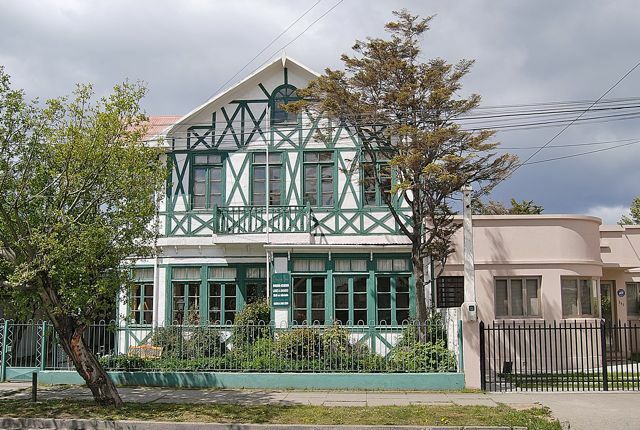 If you find yourself in Punta Arenas on a quiet Sunday, this is one of best excursions you can take. Meanwhile, when I returned to truly summery Santiago yesterday afternoon, it was a city whose extensive Metro system has gone on strike - or at least its operators have done so. 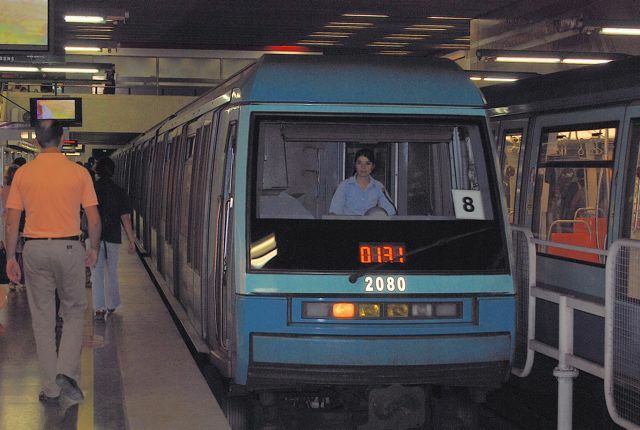 In a city whose subway is one of the world’s most automated systems, people I spoke with here have told me that the effect has been minimal but, if the strike lasts until Sunday, there will be no service on that day. That could affect people who want to get around to visit friends and family for their Sunday lunch or barbecue - a tradition that fills the time from early afternoon to at least early evening - but it won’t stop people from getting to work on Monday.